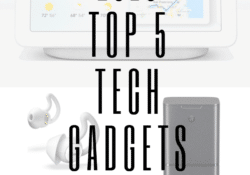 I’m excited to give you my list of top tech gadgets this year. I’ve written this guide to help you find some new tech items that you might not know about — unique items that might be new to 2018 or gadgets that have not made it to mainstream yet. These tech gadgets are meant to make your life as a truck driver easier — whether you’re on the road or not. Before I jump into that list, let me give you my top three new items in old categories. Now on to some new tech that’s not quite as mainstream. Automatic vacuum cleaners have been out for several years, but one that grabbed my attention recently is the Roomba i7 from iRobot. For $949 you can get the fully automated intelligent vacuum that allows you to control which rooms are cleaned and when, and when finished it returns to its base and empties on its own. With this digital assistant, you don’t have to think about vacuuming for weeks at a time. If you want to keep your eye on things, the Blink XT wire-free security camera might interest you. Blink has advertised that the battery life for this little camera is two years, so it’s pretty low maintenance. A set of non-rechargeable AA lithium batteries should last for about 40,000 seconds of motion active video. It sends alerts & HD video to your smartphone for you to review. You can get the Blink XT for around $119. I talked about the Tile Slim on last year’s gadget list but wanted to mention a slightly different version of the device called the Tile Sport. Find your keys. Find your phone. Find anything—they claim. The sport has a 200 ft. range and connects to your smartphone using Bluetooth LE technology. It’s durable and waterproof up to 1.5m for 30 minutes. It’s hard to miss with the 88-decibel melody, and easy to afford at around $20. The Google Home Hub is a tablet like assistant you can use in your home or kitchen. You can control it using the touch screen or voice control via the Google Assistant software. With it you can scroll pictures or watch live TV. You can ask it about the weather, search for a place to eat, or even ask it for a recipe that is quickly displayed on the screen hands-free while you cook. Google Assistant has even been ranked “smarter” than Amazon’s Alexa, Apple’s Siri, and Microsoft’s Cortana, but they’re close. You can pick one up for about $150. If all this searching for the latest-greatest tech leaves you wore out, then the final item on my list might help—the Bose Sleepbuds. Bose is known for its ability to cancel out unwanted noise and bring you filtered clear sound. The buds don’t stream music or have acoustic noise cancellation. Instead, they use pre-loaded, soothing masking sounds to cover up unwanted nighttime noises, like traffic, snoring, or even loud neighbors. Bose has a limited 2-year warranty, and you can pick up a set for $249. We can’t wait to see what kind of tech gadgets next year will bring. What are your favorite devices for life on — and off — the road? Let us know! DTI drivers work out of regional distribution centers and several terminals. To assure maximum home time, we prefer to hire drivers from a 100-mile radius around our locations. Search current job listings or create a profile to be notified of future openings.